What does the Australian election mean for Greens? The dust is still whirling around the Australian political landscape. As I write, not only are the coalition talks barely beginning, but with five seats still in doubt it’s not yet clear where the balance of power lies. Still, there are some conclusions we can draw at this stage that are interesting for Greens in Australia, the UK and potentially elsewhere. Like in the UK earlier this year, this was the best-ever election result for the Australian Greens. They won a seat in the House of Representatives for the first time in a competitive election, and increased their vote share to its highest national level. Not only will they potentially hold the balance of power in the House of Representatives (two recounts are currently underway that could potentially give them further seats), they’ll also increase their group in the Senate, further adding to their influence. Above all else, the result is hugely encouraging for Green Parties, and a further demonstration that they have the opportunity to become mainstream across the world. An important point here is that Australian alternative preferences are distributed in a way that strengthens the major parties, which I believe isn’t proposed for the UK. Nevertheless, much of what we’re seeing about AV suggests it won’t make it much easier for parties like the Greens to overcome the electoral bias. Julia Gillard’s post-election speech to the faithful was downbeat. She started it by quoting Bill Clinton’s line that it will take a while to work out what the people had said. In contrast, Abbott was optimistic, presenting the result as a rejection of Labor. As we saw in the UK, the coverage in the first days are key for forming the accepted wisdom of what the election result ‘means’ – and once this is established it binds the hands of potential coalition partners. If it becomes accepted that Labor lost the election, it will be much harder for the Greens to take the plunge and be the decisive vote in supporting a Labor government. This creates a dilemma for the Greens. They could try to head off the development of this narrative by declaring that they consider Labor the election winners (say, on the basis that they had more two-party preference) and would form a government only with them. This might be effective in holding back the Coalition, but it would also make it much harder for the Greens to hold out for key policy agreements with Labor. A middle ground might be sensible – something like the Lib Dems’ line that they would talk to the Tories first but would then open talks with Labour – but whatever they choose, they benefit from acting quickly. This entry was posted on Sunday, August 22nd, 2010 at 12:22	and is filed under Climate Sock, Politics. You can follow any responses to this entry through the RSS 2.0 feed. Both comments and pings are currently closed. I think you forget that we also have a Senate. The Greens fared very well there indeed, and will now hold the balance of power. The makeup of the senate will probably play a big role in defining who will lead government. 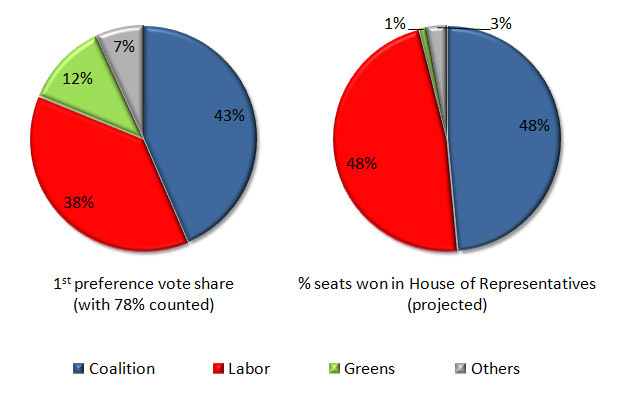 This is why Labor is in with a better chance to form minority government, even if they end up with less seats than the Coalition. JJ – thanks, completely agree that the gains in the Senate will help the Greens (as I mention in p3). It’s been interesting already to see the differing line that Adam Bandt and Bob Brown have been taking towards a coalition, which I think is partly influenced by this.